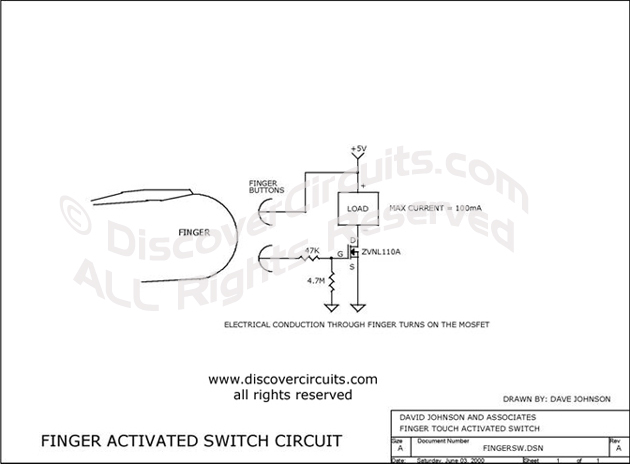 Circuit: FINGER TOUCH ACTIVATED SWITCH__ Circuit designed by David A. Johnson, P.E. It does not get any easier if you want a solid state switch that is activated by the touch of a finger. Two small metal pins route voltage through the finger skin to a MOSFET switch. The circuit is great for situations where a membrane type mechanical switch is not desired.